This is a flannel quilt I'm working on for my niece.I ran out of the light printed material. Had gotten it at JoAnn Fabrics. Went to all the JoAnn's in my area and could find anymore . Found a lot of the blue . 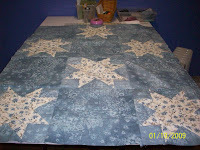 With the suggestion of my friend, Beth, I made big squares inbetween the stars. She said it looked like the night sky with stars. Looking at it now, I think it's better this way anyway. Maybe would have been too many stars. I agree with Beth that it looks like a night sky, and I like it better this way too. Funny how the best things sometimes happen by mistake. FL night's can be cool, she will love it! Very sweet...and it is finished!! Hooray! !